Our necklace collection sparkles for every occasion, whether you're looking for something to wear daily or to celebrate something special! Sparkling in diamonds and dripping glamorously in gemstones, Icing On The Ring provides pendants for women in a series of supremely immaculate designs, unique gemstones in vibrant colors, and variances in shapes to provide either a casual or evening night look. Each statement necklace is carefully curated in hand-assortment providing a one-of-a-kind and intimate look relative to each necklace. Whether it be a token of appreciation from an admirer or a gift for yourself, these dainty fashion necklaces will make a wonderful addition to your wardrobe. From our colorful selection of necklaces for women, we have a wide array of diamonds, moissanite jewelry, or any various vivacious gemstone. The pendant necklaces are chiseled into a diverse range of options for every taste in fashion. The 18k white gold necklaces from Tacori’s Dantela collection come fashioned with a moissanite into the center of the pendant to add a wonderful and reasonable alternative to a diamond. 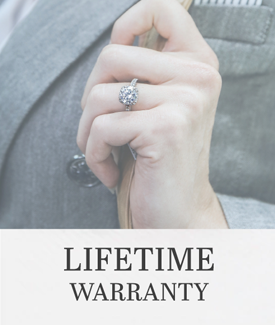 Diamond necklaces can be pricey and moissanites provide an affordable and ethical substitute. The moissanite jewelry available at the Los Angeles Jewelry District is outstanding in every facet and exceeds all standards for gemstones. We encourage delving into the research of necklace lengths to support educated buys for your special occasion. With a 14-16 inch necklace, this type of necklace fits like a choker with no slack. An 18-inch necklace sits right below the throat on the collarbone. A 20-24 inch necklace hangs between the collarbone in the middle of the chest and above the bust. 28-36 inches is referred to as an opera style fitted for high necklines and evening wear. 36-42 inches is fit for elegant business or evening wear. Each necklace length provides a distinct look and style. A cushion cut Prasiolite gemstone is bezel set in delicate silver with beautiful milgrain and crescent details on this stunning necklace.